There’s a cake shop next door, a giant hamster over the road and soldiers are fighting zombies on the roof. MARY HAMILTON welcomes you to the new-look Evening News. Breaking news: the postman has delivered a letter. That’s how most of the news comes in to the Home Sweet Home offices of the Evening News. It’s delivered by a tall man in short trousers, a flat cap and socks, who leaves the envelopes leaning up against the front canopy of the 20cm cardboard building. 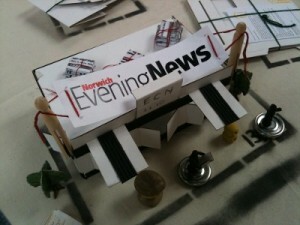 I built the office myself, from flat-pack cutout to fully-fledged busy office building complete with newspaper bundles and Plasticene journalists, sharing glue, card and colouring pens with neighbours and strangers. I even recreated Bernard Meadows’ eyecatching bronze ball sculptures, carefully rolling and squeezing yellow moulding clay and poking it gingerly with a pencil, before giving the rest of my clay to an excited six-year-old who wanted to make bees for her garden. It is part of a performance – or perhaps an exhibition – called Home Sweet Home, the brainchild of Goldsmiths graduates Abigail Conway and Lucy Hayhoe, in which participants build their own city from flat-pack parts and then experience its evolution as it fills with people playing along. Watching the tiny town sprout from a black and white canvas into a riot of colour in the extravagant surroundings of Blackfriars Hall was both surreal and sublime, as bizarre buildings and peculiar personalities developed thanks to the imagination of neighbours. But when the letters began to arrive the town took on a new and magical dimension, with stories, greetings, and feats of collective imagination all emerging thanks to the postal service and the presenters at the radio station. My letter reads: “Dear Editor, An escaped swan ate my shoes! Please put it in your newspaper! Yours, Joz Norris, No. 188”. Immediately I spring into action. I post a breaking news update on the billboard outside the office – crafted from matchsticks, card and successive layers of paper posters – and dash off a return letter asking for more detail about the attack. Over time, petitions spring up on the community notice board. A campaign to build a public swimming pool gathers pace. Disgruntled residents try to force an election. A little girl who runs a flower shop donates a sponge-and-cocktail-stick floral display to my office. A small zombie outbreak spreads and threatens other city properties, so the Evening News drafts in a local militia to fight them off. Other businesses welcome the zombies, selling them vintage clothes and inviting them in to a night club. And I get another letter from Joz saying that he’s bought another pair of Doc Martens but he doesn’t think he’ll be able to look a swan in the eye ever again. The whole experience is a testament to the power of play. Adults and children alike tap into the storytelling possibilities of the town, expressing their personalities through their houses and opening them up as the community evolves around them. While some people come along, build houses and leave, those who stay build stories around their houses, and the whole community evolves and changes as the project progresses. A giant hamster in the back garden of one house is asked to join the Spiegeltent as a performer. A few hours later he has moved to the circus with signs advertising his upcoming performances. I spend the weekend doing what journalists do: asking questions, writing down stories, monitoring the notice board and answering letters, preparing for a burst of activity on Sunday night as I put the Home Sweet Home edition of the Evening News together. The following day, when I return to Blackfriars Hall with a stack of miniature newspapers under my arm, the Spiegeltent has disappeared, replaced by a giant hamster run with tunnels, hoops and a swimming pool. I arrive at the office to discover someone has stuck a giant red ball to my door, in imitation of the large inflatable ball currently touring Norwich as part of the Norfolk and Norwich Festival. They are planted on the church, the fire station and the city hall, too. For a short time this miniature cardboard community has been incredibly real. It has had action, politics, feuds, joy, fear and anger, and the people who created it have told hundreds of tiny stories that were, for a while, incredibly important, as they literally changed the way their city was constructed. As the houses were dismantled and returned to their owners, I felt deeply privileged to have been present at the birth and the death of Norwich’s smallest suburb, and to have been able to tell just a few of the stories the residents created.